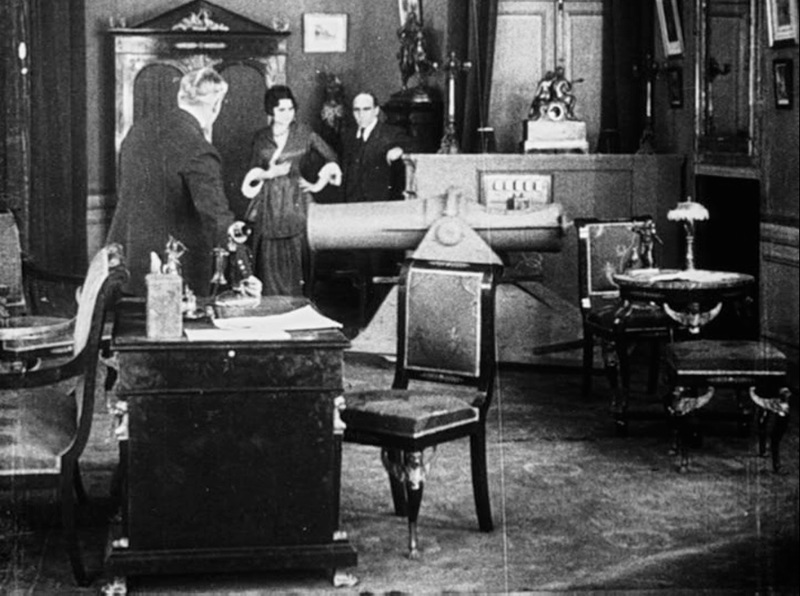 This week’s episode of “Les Vampires” tries to inject new blood into the serial by introducing a new, more sinister villain, and also alludes to the horrors of the First World War by giving him a cannon to conduct his malevolent will. Of course, it is designed more as a crime-adventure film than a horror movie, much less a Satanic movie, but the title alone earns it a place in my October history of horror. 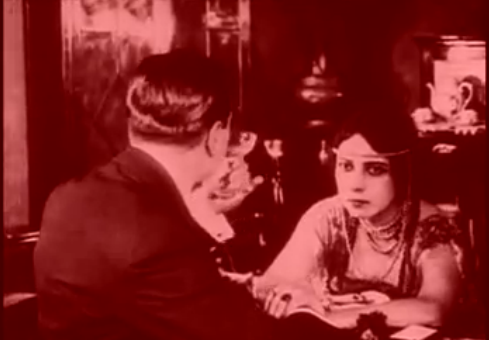 The movie’s opening takes us back to the penultimate scene of the previous episode, where Irma Vep (Musidora) and Moréno (Fernand Herrmann) have just killed the Grand Vampire. They stuff him into a trunk and prepare to dump the body, when there is a mysterious ring of the doorbell. 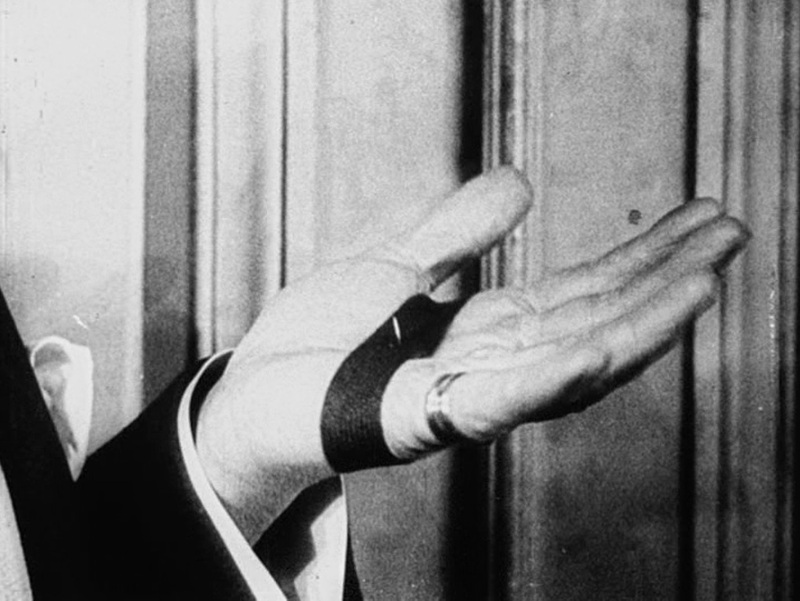 The man outside is an older man (Louis Leubas), and he prepares before going in by putting a glove over a spike tied to his hand so that it points out from the palm. He tells them that he knows what they have in the trunk, and when Moréno tries to eject him, he stabs him with the spike, which contains a paralyzing poison. He informs Moréno that he is the true leader of the Vampires, the man they just killed was an “underling.” Then he leaves them to dump the body in the river. That night, Mazamette (Marcel Lévesque) is carousing with two girls and a male friend at a cabaret owned by Moréno’s gang. Apparently, he has quite forgotten the wife and children of the first episode, because the girls are hanging all over him and he does not protest. When Moréno and Irma Vep arrive at the club, Moréno receives a card telling him that the Grand Vampire will demonstrate his power at 2AM. We see the Grand Vampire, who apparently has an office below the cabaret, pull a large cannon out of a secret cabinet, load it, and, at precisely 2AM, he fires it, destroying the cabaret (but somehow not injuring Moréno or Irma). 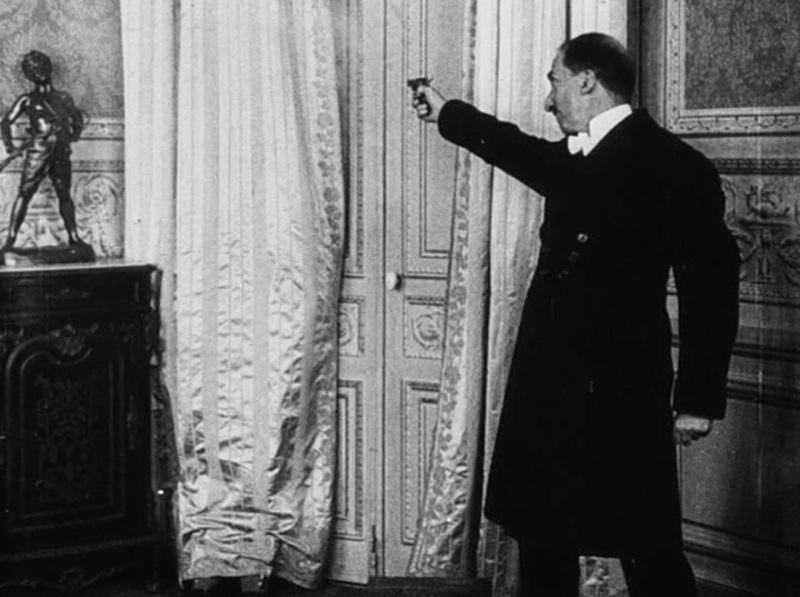 Philipe Guérande (Édouard Mathé) now decides to pay a late-night call on Mazamette, but finds only the butler there, concerned over his master’s late hours. When Mazamette returns, Guérande hides behind a curtain and listens as he entertains his guests. When the man starts going through his things without permission, Mazamette becomes annoyed and pulls a gun on him and the girls. They switch off the lights and run out (you’d think opening the door would create a silhouette, but Mazamette behaves as if he can see nothing while the light is out). When he turns on the light, he sees Guérande’s shoes beneath the curtain, and shoots blindly at the figure hiding there, making me think of Hamlet and Polonius, but fortunately Guérande has been squatting down behind the curtain, so the bullets pass harmlessly over his head. The next morning, Irma Vep and Moréno go to surrender to the true Grand Vampire, but he offers them a job instead. 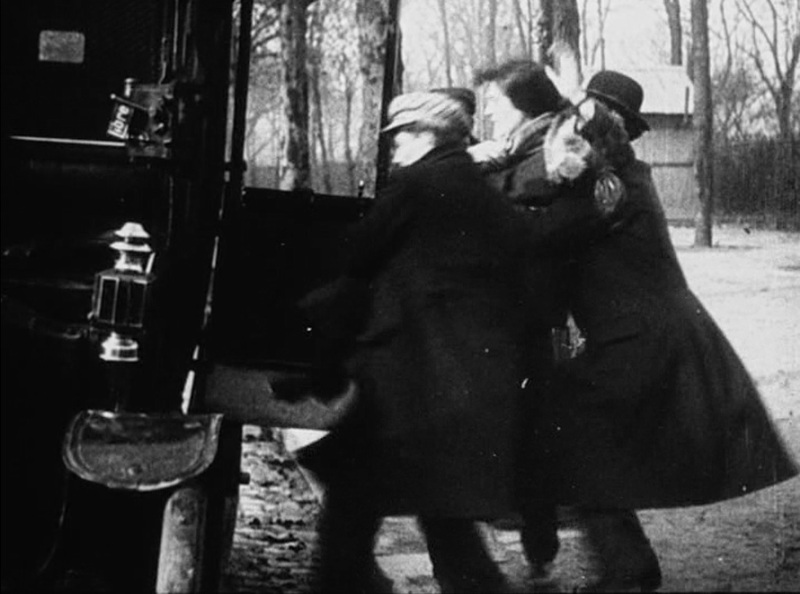 He wants them to steal from George Baldwin (Émile Keppens), a billionaire American who is staying at a Paris hotel. Moréno calls on his friend Fleur-de-Lys (Suzanne Delvé), who was one of the girls Mazamette was running around with the night before. She goes to Baldwin’s hotel and poses as a magazine reporter collecting signatures, and she gets Baldwin to sign a piece of paper. 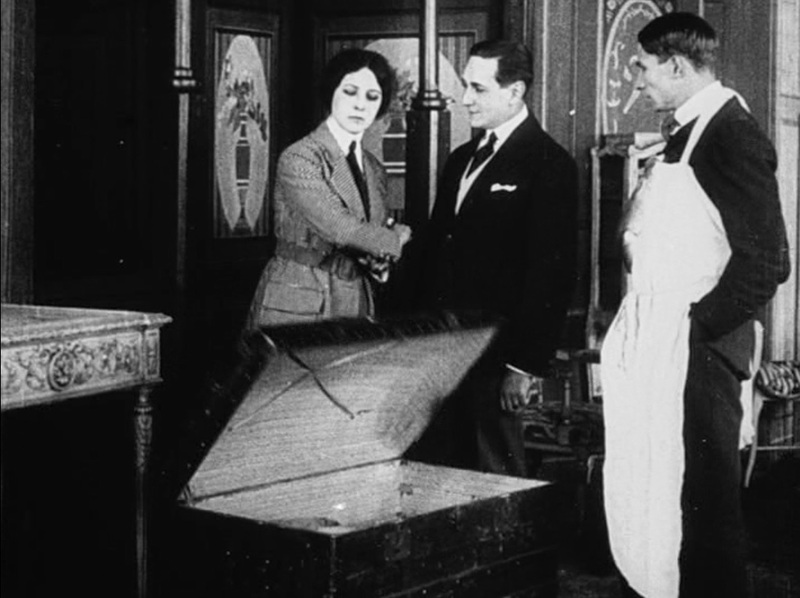 Then Irma Vep shows up with a bulky Edison cylinder-recorder and asks him to speak the only French phrase he knows into it: “Paris has the most charming women” adding on, “All right!” in English at the end. Now, Moréno uses the signature to forge a check to Fleur-de-Lys in the amount of $100,000, and sends her to cash it at a local bank. Irma Vep, meanwhile, kidnaps the switchboard operator at Baldwin’s hotel and infiltrates as her replacement. So, when the cashier at the bank gets suspicious about so large a withdrawal and calls the hotel, she plays back the cylinder recording of Baldwin praising Parisian girls, and the cashier decides Fleur-de-Lys is a high class call girl and gives her the money. At this point Mazamette walks into the bank and sees Fleur-de-Lys getting the cash and recognizes her from the cabaret. He disguises himself by pretending to have a toothache and follows her. He sees her turn the money over to Moréno and calls Guérande, who joins him at the home of Fleur-de-Lys. They threaten her with guns to make her talk about the robbery, but she, probably realizing that they wouldn’t dare shoot, refuses to say anything until they call Moréno on the phone and threaten her with arrest instead. She now tells Moréno to come over immediately. He has, meanwhile, taken the money to the Grand Vampire, who tells him to keep it, no doubt to build the morale of this highly useful follower. Now, Moréno and Irma go to the home of Fleur-de-Lys, but as soon as they walk in the door, they fall through a huge trapdoor into a bag in a basement full of police! 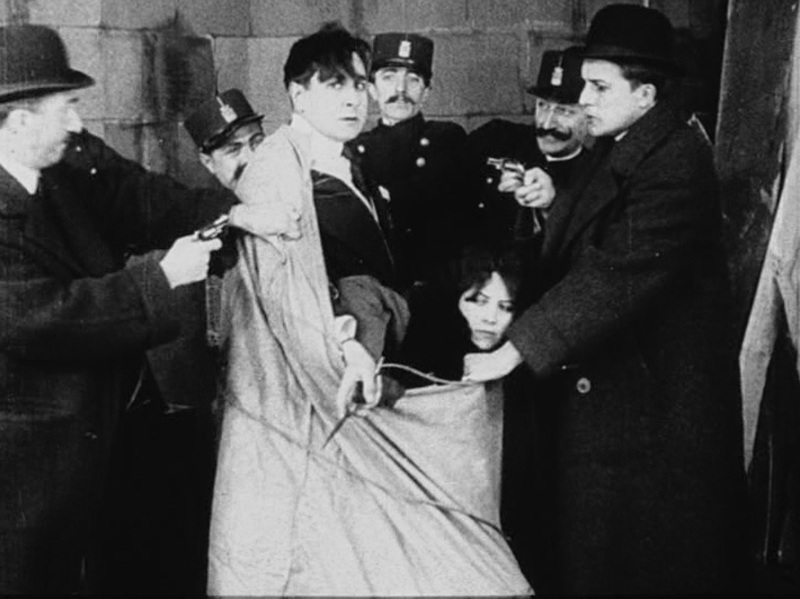 Mazamette and Guérande congratulate themselves on capturing the desperate criminals, who are taken into custody, from which they will doubtless escape in the next episode. This was an episode entirely without murders, unless Irma Vep killed the switchboard operator offscreen (possible). I was quite surprised when the new Grand Vampire only paralyzed Moréno, I thought he was dead when he got stabbed. I also thought the cannon would kill him, so this was an episode of lucky escapes for him or considerable mercy for the Grand Vampire. I said at the beginning that he seems to have been brought in to rejuvenate the series somewhat – the old GV (Jean Aymé) was sort of lame, and he kept getting defeated by Moréno’s ingenuity. Mazamette continues to be the more interesting and active hero, but his apparent abandonment of his family in his time of good fortune is disappointing. Even the butler says so! Closing the lid on a lame villain. So, for this week’s roundup of logical inconsistencies, we can start with Guérande’s narrow escape. Who would crouch down so low while eavesdropping and why? Wouldn’t his knees tend to make a big bulge in the curtain? And, really Mazamette, don’t shoot at people you can’t see clearly enough to identify, that never ends well. The crazier leap-of-logic, though, is the giant trap door that Guérande and Mazamette use to capture the villains. So, Fleur-de-Lys happens to live in a building with that trap door built into its lobby? How did they know that? Or, are we meant to believe that they cut that hole in the floor while Moréno and Irma Vep came over from their place? How will they pay back the building’s owners for all the damage? Either way, it’s wonderfully absurd.